Our attractive, high quality apartment was built in the 1990s in a style sympathetic to the other traditional buildings around. 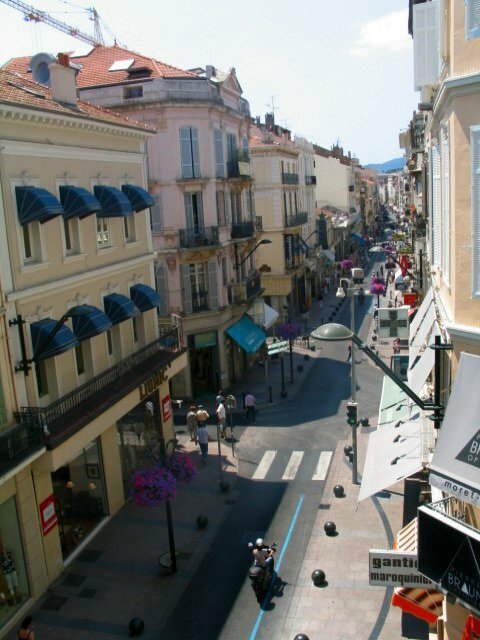 It is situated on the 3rd floor of the building and benefits from a south-west aspect with the triple window in the sitting/dining room looking directly onto the prestigious shopping street, the Rue d'Antibes and in the distance the mountains. The property is serviced by a lift and stairs to the 3rd floor. The public areas are bright, inviting and well maintained. A private, underground garage provides invaluable parking space. Reversible air conditioning heats and cools the apartment. 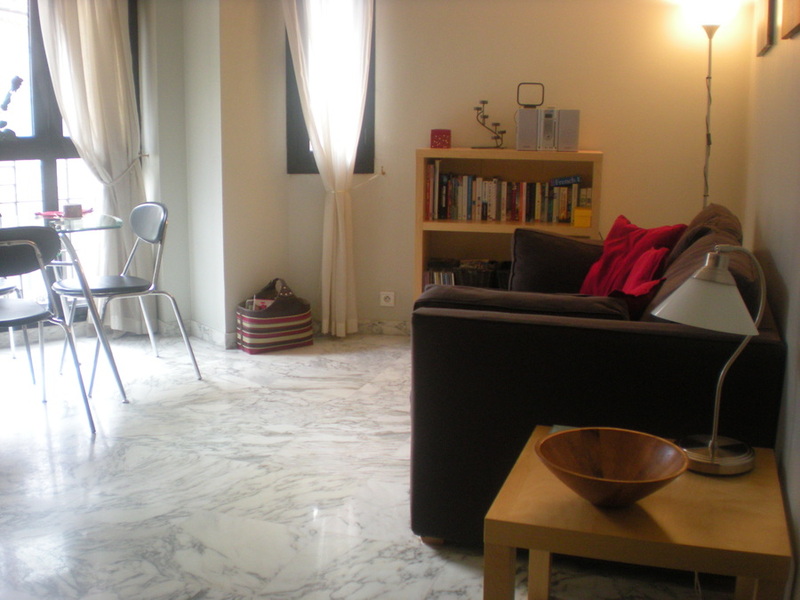 There is marble flooring throughout. The bathroom comprises of a white suite, including bath and over bath shower with fixed shower screen. 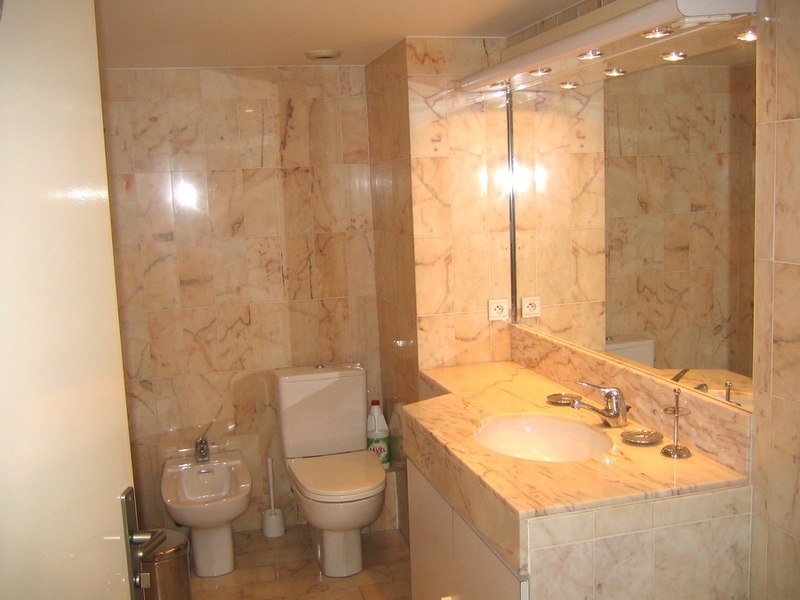 The flooring, walls and vanity unit top are finished in the finest Italian marble. There is ample shelving and a heated towel rail. The open plan, modern kitchen is equipped with all the essentials including washing machine, dishwasher, electric coffee maker, fridge-freezer, micro-wave and oven. It looks into the light and airy sitting/dining room, in which the dining room table has been positioned to gain the most of the fantastic view. The sitting room contains two sofas, both of which can be easily converted into sofa beds, various tables and shelf units. There is a radio/CD player and LCD TV which reaches English TV channels through satellite access. Internet access is available through Livebox. The bedroom has two comfortable single beds, which can be pushed together to make a double, two bedside tables with lamps and a spacious fitted wardrobe. Residence 99 is only a couple of minutes walk from the seafront - the Croisette, accessed through the gardens of the Grand Hotel and is within easy walking distance of all the major Cannes attractions, including designer shops, wonderful restaurants, fashionable bars and clubs, several cinemas (including one which shows English speaking films), the theatre and the old port and town of Le Suquet. The location of the apartment is such, that turning one way out of the main front door leads you to the fashionable side of Cannes whereas turning in the other direction leads you to a more authentic and atmospheric version of French life. The train and bus stations are within a few minutes walk, providing easy access to Nice airport and other popular locations such as Antibes, Nice and Juan les Pins. 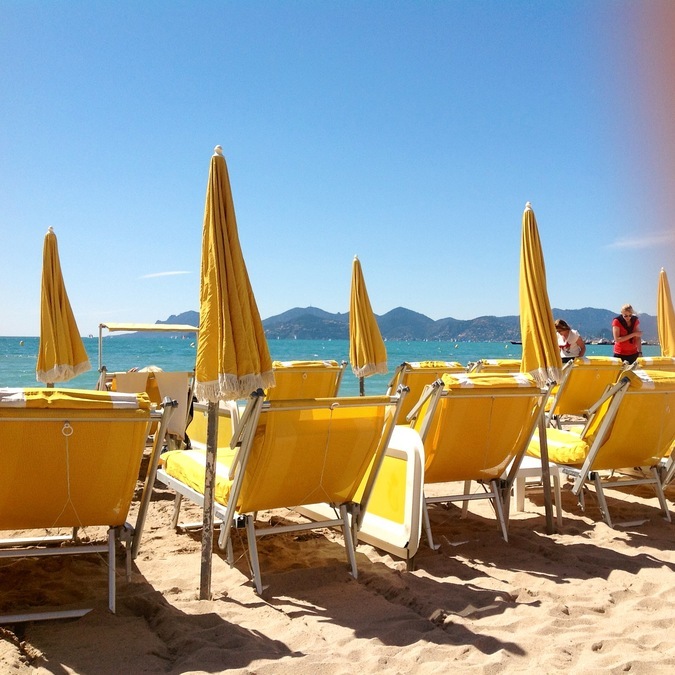 In addition to the chic, paying beaches on the Croisette, there are also several public beaches and chairs on which to sit and take in the glorious views of the Cote d'Azur. Ferries run several times a day to the beautiful Isles des Lerins off the coast of Cannes. Italy can be reached in about one hour, as can St Tropez. The nearest ski slopes are only 40 minutes away and the Olympic pistes of Isola and Auron are about 90 minutes. There is provision for 2 people to sleep in the bedroom. A further 2 people can sleep on the comfortable sofa beds in the sitting room. A contribution towards final cleaning is 70 euros. Children over the age of 10 years old but not younger because of glass table and marble floors. Nice airport is approximately 35 minutes by car and 45 minutes by bus. There is a Europcar hire depot on the street parallel to the apartment. The trainline runs all along the coast from Italy to Marseilles and the station is approximately 5 minutes walk from the apartment. The main A8 motorway is just outside Cannes city centre. Train station and bus stops are within easy walking distance. For location you really could not do better for a base to visit this beautiful part of France. The home swap apartment is located in a smart, well-maintained block and was spotlessly clean and very well equipped, providing everything we could have needed including very useful guides and maps of the area which we were able to borrow. Having access to a private garage right on the Rue d'Antibes was an added bonus. Helen was a pleasure to deal with and provided an excellent information pack on the apartment with helpful suggestions of things to do including recommendations for restaurants etc. We would thoroughly recommend the apartment and would love to go back if we visit Cannes again in the future. 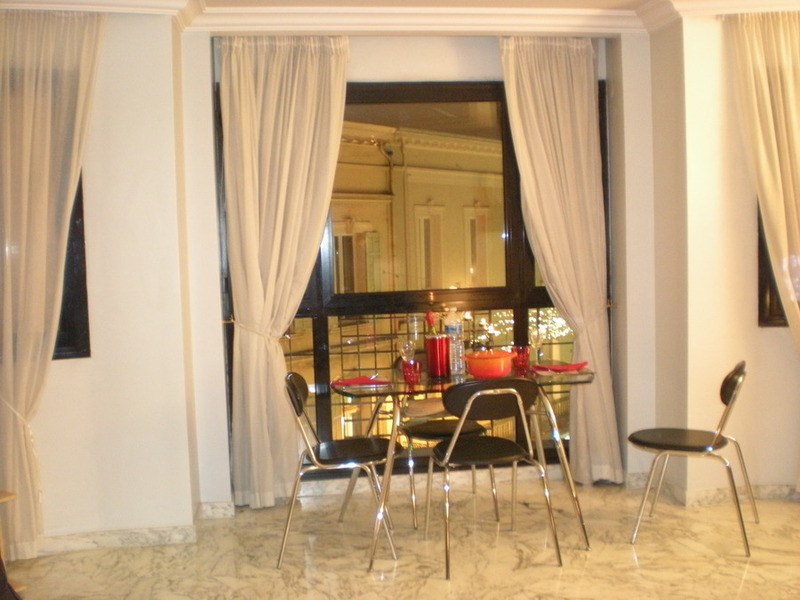 We had a wonderful time in this perfectly positioned well-maintained apartment. A car is not essential as everything in Cannes was within walking distance and transport to Nice, Monte Carlo etc is straightforward. We however did have a car as we had planned some trips to Provence to see the lavender fields and with parking at such a premium in Cannes what a blessing the garage that came with the apartment proved to be. The apartment was very comfortable and had everything we needed. By day, it's location in the busy Rue d'Antibes was a perfect spot for watching the world go by. At night it was quiet but only minutes from all the busy night life. There is an abundance of good restaurants round about and shopping from the luxury end of the market to the everyday was right on the door step. 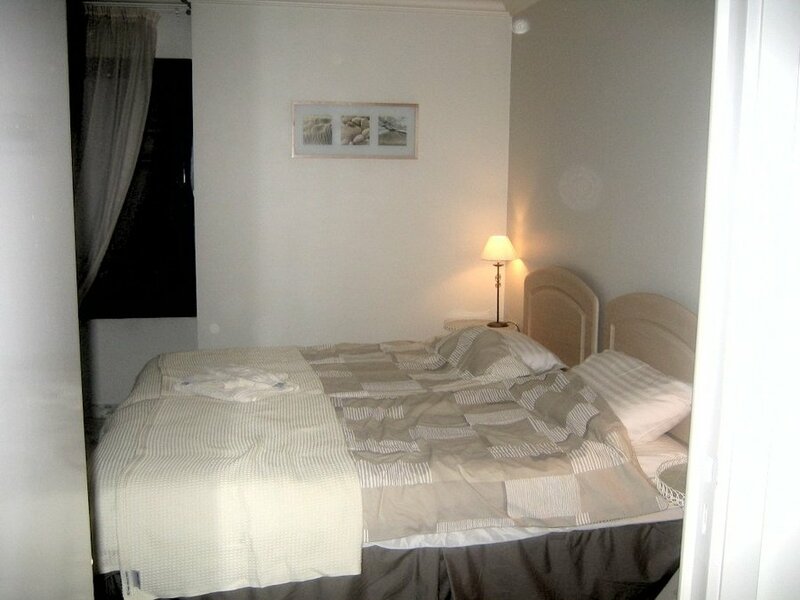 Delightful,light and airy apartment in the heart of Cannes within walking distance of all amenities.